It’s been a few months since my last D&Development post. In these retrospectives, I like to discuss some of the most important influences upon me as a D&D fan. Generally, these are things like my first rolepaying experience (Ravenloft), a favorite campaign setting (Dark Sun), or genre-related media (the Dragonriders of Pern, the D&D cartoon). Today, we go ona different track, with a product that wasn’t so much profoundly influential as it was a guilty pleasure: DragonStrike. In 1993, I was in my second year of college, and had been employed at a small Waldenbooks store for several months. It was a time in my life I look back on fondly. As a student, living at home, but working 20-30 hours a week, I had a decent amount of disposable income. Couple this with the discount I got on any purchases at the bookstore, and you shouldn’t be surprised to learn that I was buying a lot of stuff. This was the heyday of TSR’s output, with lots of campaign settings, supplements, novels, and adventures coming out regularly. It seemed like each week, I was spending a big chunk of my paycheck on D&D stuff, and loving every minute of it. Though I was purchasing plenty of 2nd edition AD&D material, I still had a fondness for Basic D&D. When the Black Box set and the Rules Cyclopedia hit the shelves, I purchased them immediately. I was especially fond of the Black Box set. This was the new, easy to master D&D Basic set, with a slick map and cardboard stand-ups for characters and monsters. It might seem quaint now, but I had never really used a map like this for my D&D sessions. Mostly, our group used graph paper mapping and if we used minis at all, it was for formations, marching orders, and that sort of thing. Using a map made D&D seem more like a board game, and this was appealing to me. Since I loved this Basic set quite a bit, you can only imagine how I felt when DragonStrike arrived at my bookstore. It was so much better than the Basic set, from a components perspective, at least. 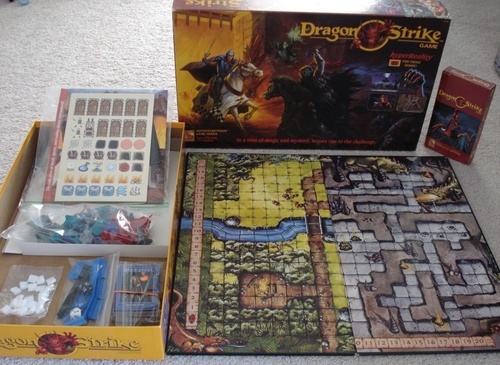 While the former included only one map, and cardboard stand-ups, the DragonStrike game had no less than four colorful maps, plus a set of plastic miniatures. DragonStrike had a sheet of cool tokens, plus character cards that weren’t paintings, but rather photographs of actual actors! I’d seen nothing like it at the time, and this sort of thing is still pretty rare. The most unique inclusion to the game was a VHS tape. This video was about half an hour long, and used the same actors from the character cards in a sort of low-budget dungeon crawl. A narrator explained what was going on, and introduced some of the basics of role playing to new players. I was far from a new player, but I still thought the video was awesome. Especially considering the use of brand new computer generated effects, which were eye-popping at the time. I remember reading through the rules over and over again, and playing through all the solo adventures. I never played DragonStrike with my regular D&D group, though I did use the maps in my campaign from time to time. I spent quite a bit of time with some younger kids from church one summer, and played the game with them a few times. They were probably around seven or eight years old, and they really enjoyed it. I can’t imagine they had more fun playing it than I did running it, though! Looking back on it now, DragonStrike is a delightfully cheesy artifact of the time period in which it was created. The video is unintentionally hilarious, with ham-fisted acting and the worst CGI effects I’ve ever seen. The miniatures are in garish colors, just as many toys of the era were. But I still look back on it fondly. DragonStrike may not be the most important thing TSR ever made, and most people will hardly remember it. 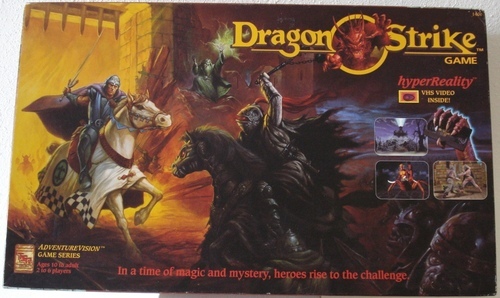 Lots of different D&D “starter sets” have been introduced over the years, but in my opinion, none will ever have as much charm and personality as DragonStrike. Thanks to rpggeek.com for images and YouTube user catjams for the video! I have this game but am missing just the adventures manual, do you know where I can get a pdf copy on short notice? I checked the BoardGameGeek page for the game, but no luck there. Sorry! I did google this, it might help.